Admire the sights of San Francisco and the Northern California coast from a different perspective on an exhilarating 1-hour seaplane flight. Take off from Sausalito and fly over the headlands and nature preserves of Marin, Tomales Bay, Point Reyes and Highway One. Passing over the Golden Gate Bridge, enjoy aerial views of top San Francisco attractions including Alcatraz, Angel Island and AT&T Park, and end with a smooth water landing back in Sausalito. Round-trip shuttle transport from San Francisco’s Pier 39 is available for your convenience. Hop on a complimentary shuttle at Pier 39 in San Francisco, or make your own way to the seaplane base in Sausalito, a beautiful bayside city just a couple miles north of the Golden Gate Bridge. 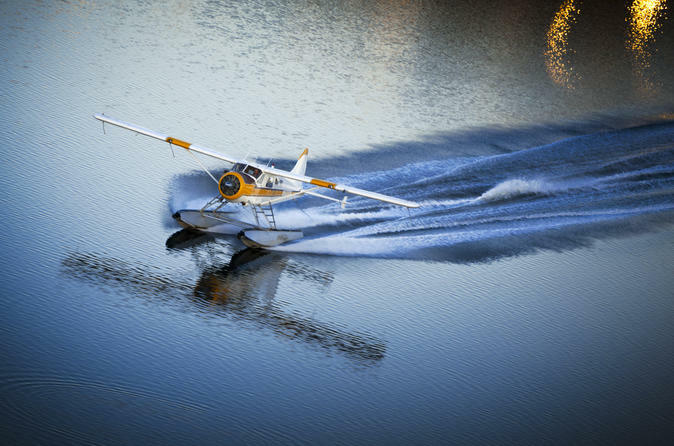 After a briefing from your expert pilot, board a 6-passenger seaplane — a fixed-wing aircraft capable of taking off and landing on water — and take to the skies. Fly over Marin Country to Tomales Bay, a long, narrow inlet of the Pacific Ocean known for its oyster farms. Then it’s on to the Point Reyes National Seashore, a scenic park preserve marked by rocky headlands, meandering estuaries, cattle-roaming pastures and some of the cleanest beaches in California. Watch for wildlife and spot the historic Point Reyes Lighthouse, a popular lookout for whale-watchers. Continue along Highway One, stretching its way down the breathtaking Northern Californian coastline. Have your camera out as you pass over the iconic Golden Gate Bridge! Look down onto Crissy Field, Coit Tower, the skyscrapers of downtown San Francisco and AT&T Park, home of the San Francisco Giants baseball team. Veer over to Alcatraz Island, a notorious former prison, and pass by historic Angel Island, the immigrant gateway to America in the early 1900s. Enjoy a smooth water landing in Sausalito’s Richardson Bay to conclude your 1-hour seaplane tour.